I know that despite it not being a good idea, many parents are planning to fulfill their child’s wish this holiday season and get their kids a new pet. If you’ve done your due diligence, you understand that this requires a large commitment of time (and micromanagement) on your behalf. So it’s important to start with something small that helps you teach children how to responsibly care for animals. This is why we absolutely LOVE BioBubble Pets and particularly, the BioBubble Premium . The bottom line is that it’s a system that allows you to move into different species as your children mature. Start with an herb garden, move into an aquarium, turn it back into a land-based environment for lizards, then into critters, then eventually into small birds. This is all done by adding or deleting risers in a single BioBubble Premium Habitat . It’s a planter, terrarium, aquarium or small animal habitat: all in one, beautiful, affordable environment. Which also makes it the perfect educational tool for teaching children about responsible pet care. There are four versions of the product – the Premium, Aquatic, Terra and Bubble. We reviewed the premium BioBubble. This habitat, which retails for only $149 (even less on Amazon), can be adapted to support saltwater or freshwater fish, small reptiles, aquatic and land turtles, insects, plants or even small birds. This flexibility allows you to move between species as you have them. We initially debated what type of animal we should bring into our household, but finally decided that we weren’t quite ready for yet another pet. So we opted to turn this into an herb garden. The design keeps the plants at a perfect temperature, even in winter, which makes it a perfect indoor garden. For soil and substrates, the durable plastic planting tray (included in premium) holds both wet and dry plant material. But if you are considering an aqua garden, it comes with other risers you can adapt. Once our herb garden matures, we may incorporate a few caterpillars into the garden. We have lots of beautiful caterpillars on our trees and this will be a perfect opportunity to help them thrive. 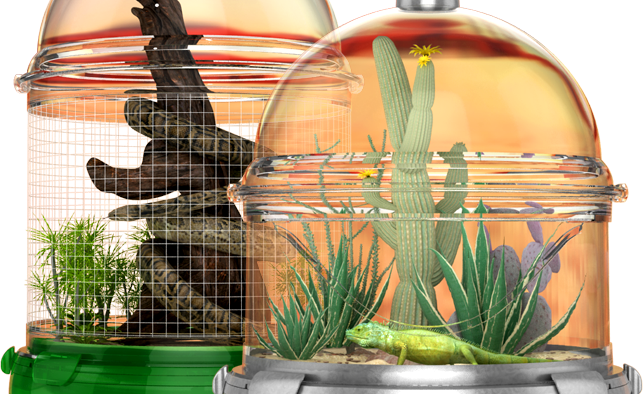 The BioBubble makes a perfect climate-controlled environment for the little creatures. Since the Black Swallowtail butterfly thrives on parsley, dill and fennel – we’ll have lots of herbs to feed them! (Here’s a guide on how to feed caterpillars to raise butterflies). Next, if we decide we are ready for a pet after the garden and butterflies, we may move on to a Leopard Gecko. This is as easy as changing out the risers of the BioBubble. The system utilizes a Carbon Fresh Pad system that eliminates odors before they start. This is a perfect set up for reptiles, mice, or other small critters. If you decide to move into a warm-blooded habitat, you can add as many risers as you wish to create an apartment-type bungalow with plenty of room for the animal to move around. If we were to decide on another aquarium, we could do that just as easily by removing the mesh riser. Voila! Instant aquarium! Now, before you rush out and get this item, be VERY aware that it is not any where near large enough to handle the fish seen in the picture below. Those types of fish grow very large, very quickly. In a fresh water aquarium, you’ll need to stick with 5-6 neon fish or a single betta, which still makes it a great starter aquarium. The entire tank is only about 5 gallons, so you need to plan accordingly. You should always estimate the size of a full grown fish, then plan one inch per gallon. For example, a 50 gallon aquarium can “theoretically” handle a 50″ of fish (which may only be 3 larger fish in a salt water aquarium). But, that said, we love this picture and wanted to show it to you. The Premier version comes with a filtration system. The pump circulates and filters up to 60 gallons of water per hour through fine mesh media and is designed to provide residual heat to maintain comfortable temperatures for a wide variety of aquatic animals. Since proper aeration is vital to the health of all aquatic animals the filtration unit has built-in airflow channels and a check valve. Cleaning is simple because you merely remove the substrate tray and replace it with fresh carbon and bedding. The CapLite with interchangeable LED lamp technology allows you to mix and match colored bulbs in order to create spectacular effects inside the BioBubble – particularly for aquariums. At only $149, we believe this is the perfect gift for children who are set on having a new pet this holiday season. Start them out slowly, let them move through the process, and use the BioBubble for any starter species. Just as an FYI, they also have some very large habitats that could take up an entire room, but you’ll have to speak to them for an estimate on cost. Here are a few of the ones we saw at Global Pet Expo this year.